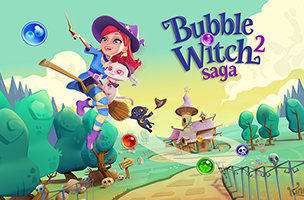 After briefly teasing the game earlier this year, King has officially launched Bubble Witch Saga 2 on Facebook and mobile devices. The game takes players to a colorful world of friendly witches and animals, and challenges them to complete bubble-shooting levels with limited numbers of moves. Fans of the original Bubble Witch Saga will recognize the gameplay here, as users have a limited number of bubbles to shoot towards formations at the top of the screen, with each level having a different goal. That is, some may ask players to clear six spaces across the top row of the board, while others may feature rotating boards of bubbles and the goal of freeing a ghost trapped in the middle of them. Users clear bubbles by making groups of three or more touching, like-colored bubbles, regardless of their formation. The bottom of each level is comprised of bubbling cauldrons, which offer bonus points when bubbles drop into them. In addition, spiders rest along the bottom of the screen, and offer points combos as falling bubbles bounce off and around them. These spiders disappear when matches aren’t made on each shot, so strategy comes into play when gamers want all three stars on a single stage. Players have access to power-ups, with some offered for free, and the rest coming for purchase. These may offer rainbow bubbles which can match any bubbles on the board, or fire bubbles that clear whole sections of bubbles from the screen. If players fail to complete a level’s stage before moves run out, they’ll lose a life, which will recharge automatically over time. Bubble Witch Saga 2 is now available to play for free on Facebook and mobile devices. The mobile version offers Facebook connect for cross-platform play, allowing users to take their progress with them wherever they go. Check back soon to follow the game on AppData.